1. Create a cancel button in UITextField. By default, the cancel button is disable when a new UITextField control is added to view. The button can be enabled by changing the option for Clear Button of the UITextField property. 2. 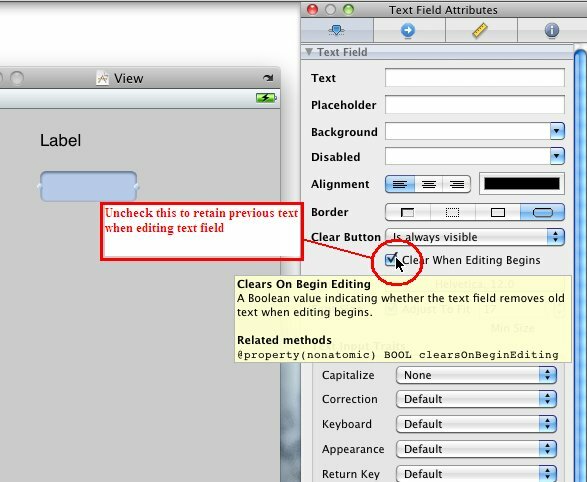 Disable the clearing old text in UITextField editing. By default, when text is input to the UITextField, any previous entered text will be cleared. This can be disabled by unchecking the clear when editing begins option. Nice and very helpful information i have got from your post. Even your whole blog is full of interesting information which is the great sign of a great blogger. Awesome Inc. theme. Theme images by mariusFM77. Powered by Blogger.